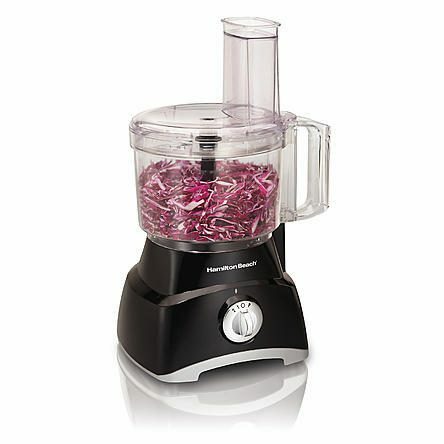 Hamilton Beach Brands Inc. 8 Cup Food Processor Only $19.99! Down From $39.99! You are here: Home / Great Deals / Hamilton Beach Brands Inc. 8 Cup Food Processor Only $19.99! Down From $39.99! Sears has this Hamilton Beach Brands Inc. 8 Cup Food Processor on sale for $19.99 (Reg. $39.99)! Plus you can get FREE shipping on orders over $30 or FREE in-store pick up! Get ready to be chopping, mixing and pureeing up a storm. With the power of a 450 watt motor, your cooking will be the talk of the town. Slice salad ingredients, shred cabbage, grate cheese and combine sauces with ease when you add this highly versatile food processor to your kitchen collection.